Militants shift shelling activity from Donetsk to Luhansk sector. Over the past day, Russia-backed militants 12 times violated the ceasefire on Donbas. Ukrainian servicemen on eight occasions returned fire to suppress the enemy. As a result of the fighting, two Ukrainian soldiers were wounded and two sustained injuries, the press center of the antiterrorist operation (ATO) said in a Facebook on Tuesday, 10 October. 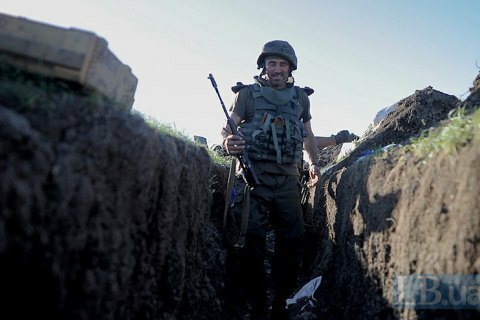 At the end of the day, the combat activity of the Russian-occupation groups shifted from the Donetsk to Luhansk sector, which was relatively calm previously. After 6 pm Kyiv time the terrorists opened fire from grenade launchers, heavy machine guns and small arms on the positions of Ukrainian troops on the outskirts of Stanytsy Luhanska, Valuiske, Novooleksandrivka, and Trekhizbenka. In the coastal sector, the enemy for a few hours after have fired IFV weapons, automatic grenade launchers and machine guns at Ukrainian strongholds near Hnutove. "One our trooper was wounded and another injured in the shelling. In response, the ATO used the whole range of non-prohibited infantry weapons," the HQ report says. It was relatively quiet in the Donetsk sector in the evening, with the exception of a brief of use of small arms near the village of Zaitsevo. On Monday afternoon, one Ukrainian soldier was wounded and another injured by enemy shelling.